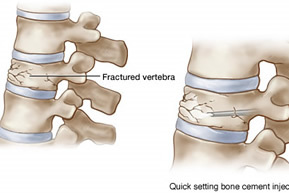 The procedure involves placing a needle into a fractured vertebral body and injecting a special type of bone cement. Many patients experience a dramatic decrease in their pain. Approximately 700,000 vertebral, or spinal bone, fractures occur each year — usually in women over the age of 60. Researchers estimate that at least 25 percent of women and a somewhat smaller percentage of men over the age of 50 will suffer one or more spinal fractures. Younger people also suffer these fractures, particularly those whose bones have become fragile due to the long-term use of steroids or other drugs to treat a variety of diseases such as lupus, asthma and rheumatoid arthritis. Of particular concern are spinal fractures caused by a progressive weakening of the bone -- a condition called osteoporosis. The pain and loss of movement that often accompany bone fractures of the spine are perhaps the most feared and debilitating side effects of osteoporosis. For many people with osteoporosis, a spinal fracture means severely limited activity, constant pain and a serious reduction in the quality of their lives.